Terry, my college roommate—who has been a like-a-sister friend for more than three decades—came to New York on Friday for a long overdue weekend visit. In the days before, we’d ticked through a number of possible activities for our time together and, at her suggestion, we added worship to our list of “definites.” On her last visit to New York, we’d attended Mass at St. Patrick’s so this time around it would be Kabbalat Shabbat at Shaaray Tefila. We opted for this particular service both because it’s shorter than the minyan and because it would leave all day Saturday free for whatever else we decided to do. In his drash, Rabbi Stein spoke about the randomness of that morning’s shooting at the Empire StateBuilding and the role of fate and mazel in our lives. Later in the service, Terry was especially struck by this particular passage in the siddur: “There is evil enough to break the heart, and there is good enough to exult the soul." During our “debrief” over dinner, she also told me how much she enjoyed the service, the music, and all the congregational participation. Fast forward to Saturday at about 6:40 p.m. as we made our way around the beautiful fountain footprints of first the South Tower and then the North Tower of the 9/11 Memorial—our fingers gently touching the letters comprising the names of so very many souls lost on that day. One in particular—Michael S. Costello—the boyfriend of one of her husband’s cousins, gave us special pause. Terry told me he was "loud, fun-loving and a good guy." 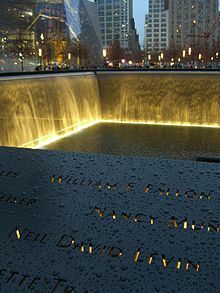 We also talked about Neil David Levin, who, although we neither saw his name nor knew him personally, was a fellow alum of our beloved Lafayette College and, at the time of his death on 9/11, the executive director of the Port Authority. 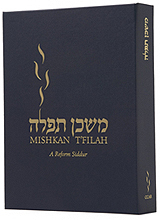 As dusk fell and the names became illuminated by the soft lights below, we talked more about fate, mazel, chance, and fortune, and also about the words from Mishkan T’fila that had caught Terry’s eye. May Stitch Costello, Neil Levin and the other 2995 completely innocent souls killed on that awful day rest in peace, and may 5773 usher in a time in which the good that exults our souls far outweighs the evil that breaks our hearts.